In medium bowl, beat cream cheese, sugar and 1 egg with electric mixer on medium speed until smooth. Stir in 1 cup of the chocolate chips; set aside. In large bowl, beat cake mix, water, oil and 3 eggs on low speed 30 seconds. Beat on medium speed 2 minutes. Divide batter among muffin cups (1/4 cup in each). Top each with 1 heaping teaspoon cream cheese mixture. Bake 21 to 27 minutes or until tops spring back when touched lightly. Cool in pans 10 minutes. Remove from pans to cooling racks. Cool completely, about 30 minutes. Frost with frosting. Sprinkle with remaining 1/2 cup chocolate chips. Store loosely covered in refrigerator. How about a Dalmatian-themed party? 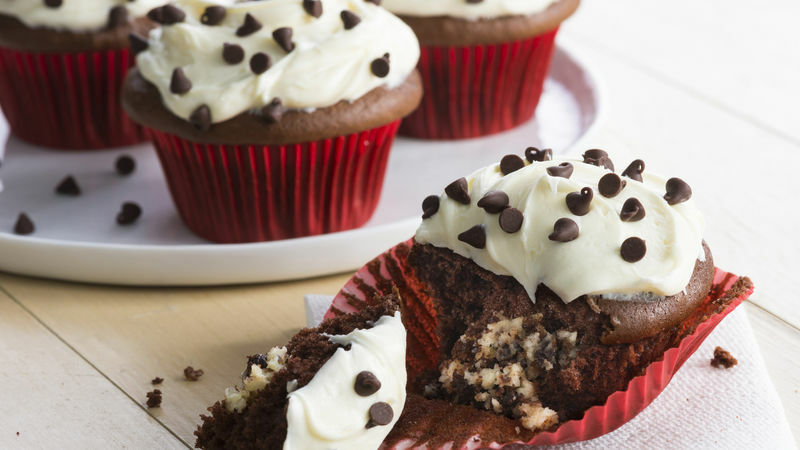 Serve cupcakes with chocolate chip ice cream, play “pin the spot on the dog,” and send kids home with a “doggie bag” full of dog-themed treats and prizes. Wrap individual cupcakes tightly in plastic wrap, and include in lunch boxes for an extra-special lunchtime treat! Get a party menu, prep guide, tips, party games, activities and more for a Firehouse Birthday Party!